Bowlers set up victory for home side in tournament opener after restricting India to 174/5 despite Shikhar Dhawan’s 49-ball 90. Sri Lanka couldn’t have asked for a better outcome in the opener of the Nidahas Trophy, the tri-series celebrating the 70th anniversary of the island nation’s independence. 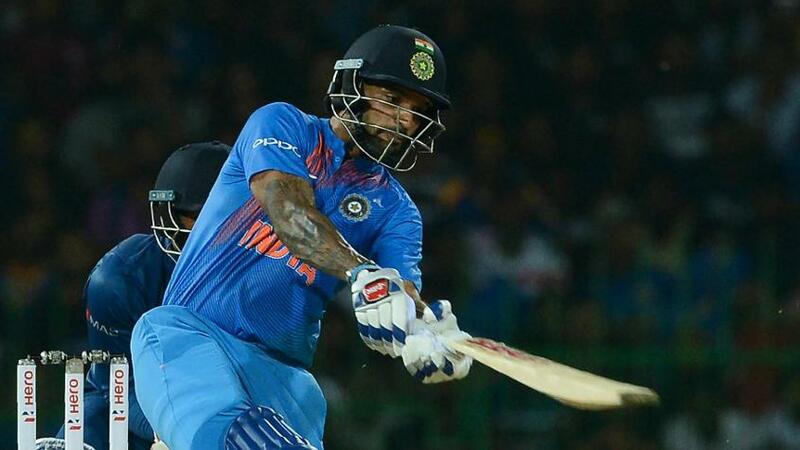 They beat India by five wickets at the R Premadasa Stadium in Colombo on Tuesday 6 March largely thanks to Kusal Perera’s belligerent 37-ball 66, which helped topple the 175-run target in 18.3 overs after Shikhar Dhawan’s 49-ball 90 had helped propel India to 174/5, par on a batting beauty. Sri Lanka lost Kusal Mendis early on, Washington Sundar prompting him to slice a catch to mid-on for just 11. However, India in general, and Shardul Thakur in particular, would want to forget what happened next, as Kusal Perera plundered 27 runs off Thakur’s first over – the third of the innings. Danushka Gunathilaka then got into the act, lifting sixes off Sundar and Jaydev Unadkat before falling to the latter’s slower delivery. But Kusal Perera carried on, powering sixes for fun, bringing up his half-century in just 22 balls as Sri Lanka posted 75/2 in six overs, their best in the Powerplay of a Twenty20 International. Crucially, though, India chipped away at the wickets at the other end, following up Gunathilaka’s scalp with that of Dinesh Chandimal (14). Kusal Perera went on unperturbed, hammering more biggies off Suresh Raina and Yuzvendra Chahal before eventually falling to Sundar, stumped after being deceived by turn. Thakur was brought back in immediately, and he, commendably, gave away just eight runs over his next two overs. India applied the squeeze, and when Chahal had Upul Tharanga bowled for 17, India must have sensed that they could still win this. The Pereras have won it for Sri Lanka. Kusal with a half century, and Thisara with 22 from 10 to seal the deal. However, another Perera – Thisara – along with Dasun Shanaka put on a watchful, unbroken stand of 39, with Unadkat conceding 16 runs in the 18th over when Sri Lanka needed just 24. Victory was soon brought up with nine balls to spare. Earlier, India got off to a horrendous start. Rohit Sharma, their captain for the series, was dismissed for a duck in the fourth ball of the innings by Dushmantha Chameera. In the next over, Raina exposed his stumps and was bowled by Nuwan Pradeep. With India at 9/2, Sri Lanka had the early advantage. However, India quickly wrested back the momentum, with Dhawan playing a major role. It wasn’t a flawless innings from the left-hand opener – there were plenty of top edges that could have fallen to a fielder on another day. But his enterprise quickly put India back in front, with Manish Pandey offering solid support. Pradeep, in particular, bore the brunt of Dhawan’s onslaught. He conceded 17 runs in the fifth over of the innings, and when brought back for the ninth over, Dhawan once again made merry, picking 14 off the over. With Pandey running well and occasionally finding the fence when given the chance, India went from 9/2 in two overs to 80/2 in 10. The stand was broken when Pandey holed out off Jeevan Mendis, dragging one from outside off to mid-wicket. But Dhawan carried on, even as Rishabh Pant, the new man, took time to bed in. He plundered sixes off all of Akila Dhananjaya, Gunathilaka and Chameera, but eventually mistimed one and holed out to Thisara Perera off Gunathilaka. Dinesh Karthik and Pant managed to take 14 runs off the final over, taking the total past the 170-mark. But it was never going to be sufficient after Kusal Perera’s blitz. The next match in the tournament will be played between Bangladesh and India on Thursday, 8 March.